You’ll have had it happen: someone tells you that yes, they want to buy your thing. A day goes by… a week… two weeks… no payment, no news. A lot of business owners then shy away and give up, but the smart ones follow up. Seriously though: saying that you’re checking in sends the wrong message. (Also: using the word ‘just’ isn’t a good idea, because psychologically, it reduces the size of what is probably an important decision for them). But the real problem is, that you saying you want to check in, makes it about you. It speaks of neediness, and that breaks trust. You need that sale, but if they decide to buy, it’s because — first and foremost — buying from you *is good for them*. Checking in says the opposite: it’s good for you. Ask a direct question, with the intention of helping them. Or, the powerhouse question: ask for a no. 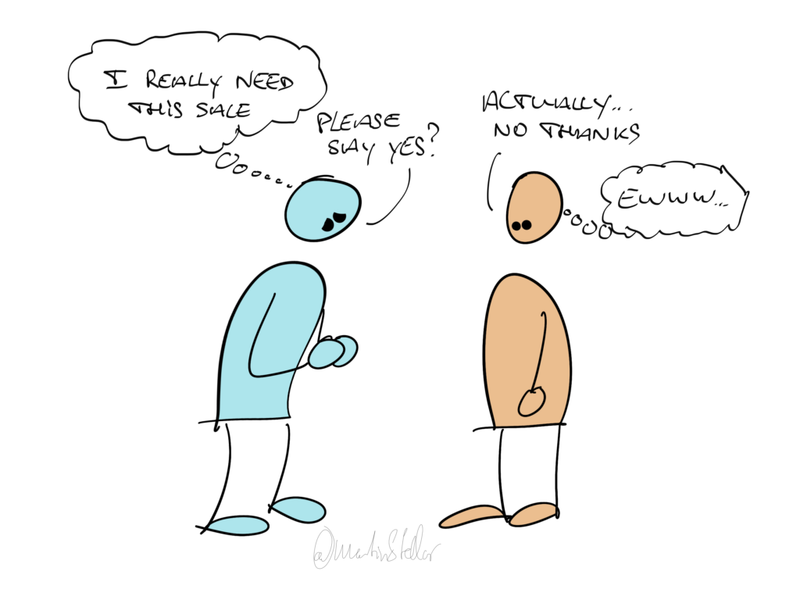 Very often, asking for a no removes the last objection to buying, the trust and confidence issue. Asking for a no makes it super clear that you’re not needy. Bam: more trust. And often: a final decision to move forward and become a client. All this, and more, in the LEAP Sales System, which I’ll reveal shortly.